This October, the tropical island will embrace a brand new 5-star resort, the Grand Fortune Bay Hotel, adding a unique luxurious hotel option to the island’s beautiful Sanya Bay. Located on a generous stretch of west coastline of Sanya Bay, the hotel is just 15 minutes from Sanya Phoenix Airport. The resort is the only one in Sanya offering an exclusive 800 sqm beach square where guests can enjoy all kinds of beach activities. Covering an area of 55 sqm, the hotel has 391 guestrooms and presidential suites, 83 mansion-home rooms and 3 sets of independent villas, all offering panoramic views of Sanya Bay. The entrance features an impressive lobby with space occupying 2,000 sqm, offering guests an unparalleled luxury feeling. 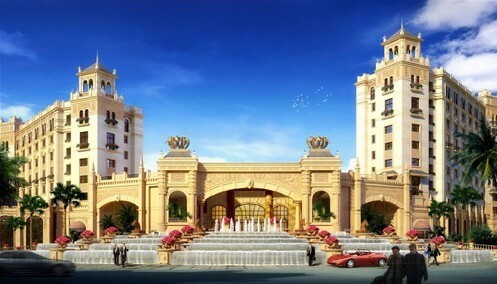 Facilities will include an elegant Chinese restaurant, a Korean restaurant, two clubhouses with various snacks and desserts, a Thai-style spa providing uniquely tropical atmosphere. With a professional team at service, the resort can cater to all types of functions from formal events to intimate business gatherings.